The American Library Association met in Chicago on July 9-15, 2009. This was also the 100th anniversary of the location of ALA's headquarters in Chicago. I put together this digital tribute to Chicago's "Great" Public Library in honor of these occasions. Attendees of the conference had the opportunity to visit the current and former central libraries of the Chicago Public Library. The former central library is now the Chicago Cultural Center, an appropriate repurposing of a historic architectural treasure. The Chicago Cultural Center includes the recently restored dome of the building which features Tiffany glass. The current central library, the Harold Washington Library Center, is also well worth a visit. The postcard to the left was produced by the prolific Teich Postcard Company. The Curt Teich Postcard Archives are located at the Lake County Discovery Museum in Wauconda, Illinois. A related webpage about the history of the American Library Association is located here. 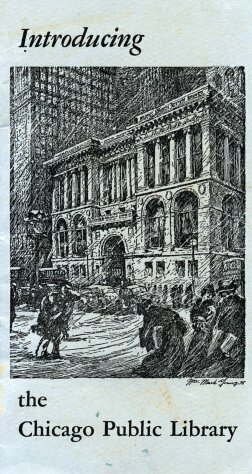 There is an overview of the history of the Chicago Public Library located on the library's website. The following digital exhibit features librariana from my personal collection and some images from the Chicago Public Library Digital Collections. The Chicago Public Library was founded in 1872 following the Great Chicago Fire of 1871. Prior to the fire, a variety of circulating and membership libraries substituted for a free public library. One of those was Cobb's Library, for-profit circulating library. Cobb's Library lost its complete collection of 5,000 books in the fire. The library re-established itself, however, and continued until 1894. 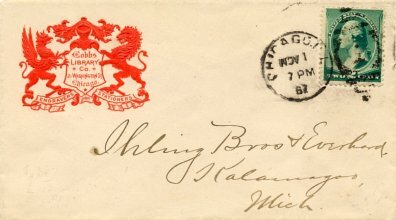 The envelope below was mailed by the Cobb's Library in 1887. 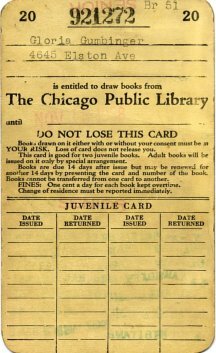 The Chicago Library Association, a fee based subscription library, lost almost all of all of its collection of 30,000 books. In all, the fire destroyed from 2 to 3 million books in various types of libraries in the city. 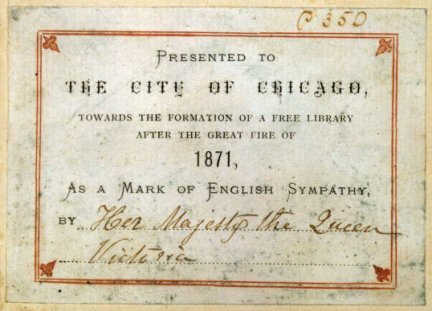 News of the tragedy of the Chicago fire spread around the world, and the people of Great Britain responded by collecting and donating books for a free public library in Chicago. The book drive was led by an Englishman named A. H. Burgess and championed by Thomas Hughes, an author and member of Parliament. Some of the most prominent people in England including Queen Victoria made donations of books. The British book donations were a motivating factor in the passage of a free public library law in Illinois and the founding of the Chicago Public Library in 1872. The image of the bookplate below is from the Chicago Public Library Digital Collections. 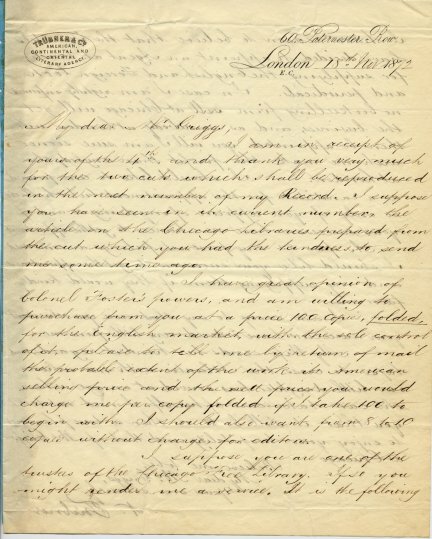 This letter from my collection was written by Nicholas Trubner, a London literary agent, to Mr. Griggs of the Griggs Publishing house in Chicago on November 15, 1872. Trubner discusses the English distribution of a book which Griggs is publishing and then solicits Griggs' assistance in securing the contract to supply the new Chicago Free Library with British and European books. 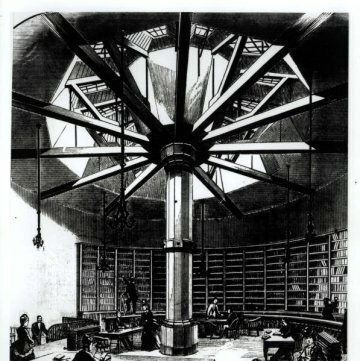 On January 1, 1873 the Chicago Public Library opened for business in a water tank that had survived the 1871 fire. 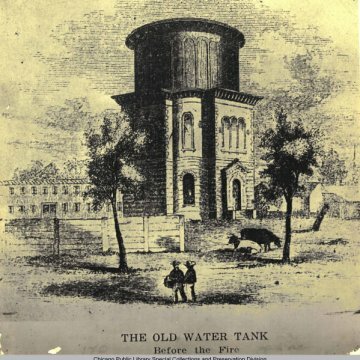 The images of the water tank below are from the Chicago Public Library Digital Collections. An 1874 postal card from my collection. 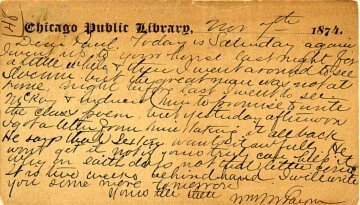 A Chicago Public Library staff member has used library stationery for a personal message. 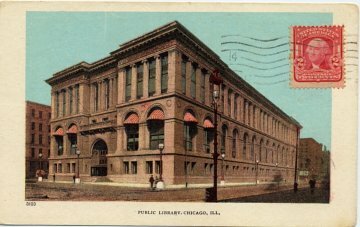 In 1897 a new building for the Chicago Public Library was completed. This is one of many postcards featuring the library building. Because of the prominence of the new building, it was also featured on many souvenir items including the spoon below. 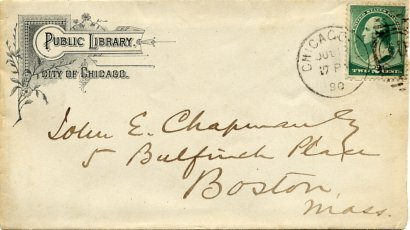 An envelope mailed by the library in 1890. A library card used in 1928-29. 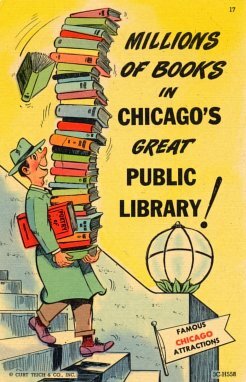 A 1947 or 1948 booklet about the collections, services, and programs of the Chicago Public Library. It features a drawing on the cover by artist William Mark Young.